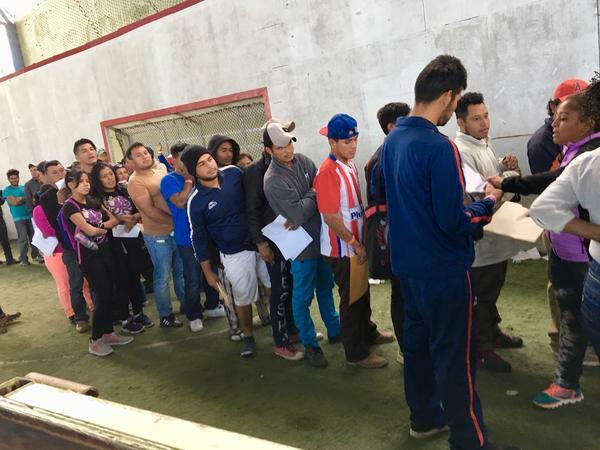 Central American migrants line up to apply for jobs at a job fair in Tijuana, Mexico. More than two thousand migrants have applied for a one-year humanitarian visa that would allow them to hold jobs legally in Mexico. Honduran migrant Rene Castillo, with new working papers in hand. 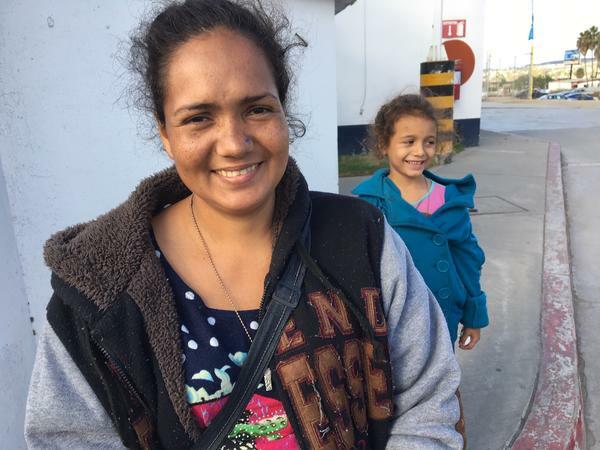 He is one of thousands of Central American migrants waiting in Tijuana to apply for asylum in the U.S.
Job-seeking Honduran migrant Claudia Hernandez and her daughter, 6-year-old Angelina Jolie. "Most of these people are still dreaming of America," he says, "but if there's a chance to get a job here, there's no way I'm not going to take it." More than two thousand of these migrants have enrolled for a one-year humanitarian visa that would allow them to hold jobs legally in Mexico. Some have already begun working. "There's around ten thousand open jobs available in the maquiladora industry," says Tijuana alderman Genaro Lopez. "Those are the factories that work for big names like Sony, Pioneer and stuff like that here in Tijuana — Panasonic, Samsung." Those assembly plants surround Tijuana and account for nearly two-thirds of the city's official economic activity. Some locals say the main reason they're hurting for workers is the low wages they offer. "We need human capital," says Nayla Rangel, the coordinator of a federally and state sponsored jobs fair that's a 20 minute hike from the migrants' shelter. "The companies keep demanding more workers, and we're having a hard time keeping up." In the large, covered courtyard where the jobs fair is being held, scores of scruffy-looking men and women from the shelter line up for interviews with government officials and industry representatives. "Every day, more and more of these people are showing up, looking for work," says Rangel. "Tijuana is essentially a city of migrants, and these ones will always be well received here." Not everyone in this crime-ridden border city is on board with migrants who entered Mexico without authorization getting jobs and official papers. "Oh, it's not good," says 90-year-old Tijuana resident Roberto Sandoval, sitting on his motorized scooter outside the jobs fair and watching the parade of prospective Central American workers. "Mexico should protect its own people, not these people that come from foreign countries." But Rene Castillo is happy. 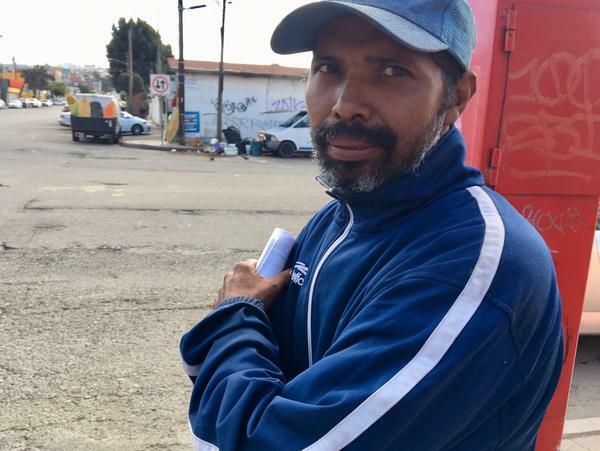 This 42-year-old construction worker from Honduras has just landed a job at a local assembly plant, where he'll start the next morning making the equivalent of $1.88 an hour. "Thank God we've been given a chance to work here in Mexico," he says. "It may not be much to start out with, but I'm not looking to make millions — I just want to get settled and see what's next." But Castillo has not yet ruled out attempting to get into the United States, where he has relatives. "No way am I giving up," he says, "I'm a positive person and I'll just have to give it a little more time." It's the same for Claudia Hernandez, a pregnant Honduran mother of four who's just gotten a contract to work at another assembly plant. "Mexico's alright," she says, "but the goal is getting to the United States — it's every Honduran's dream." But the Trump administration wants these migrants to remain in Mexico while their applications for asylum in the U.S. are being considered, a process that could take many months. Mexico is offering free transportation to those migrants who want to return to their homelands. To the rest, it's offering jobs. Now to Tijuana, where it's been raining for two days. It's made a dismal situation even more miserable for the Central Americans camped out near the U.S. border. And yet even though the migrants entered Mexico illegally, the country is offering them jobs. More and more migrants are taking up the offer. NPR's David Welna reports. DAVID WELNA, BYLINE: At the edge of the mud-filled, roofless sports complex where some 6,000 Central American migrants shelter under tents and tarps, five men in underwear bathe under a stream of cold water. Waiting his turn is a 20-year-old Honduran named Josue Pinyeda. This camp may be full of sick and discouraged refugees, he says, but people still have their dreams. WELNA: Most people here dream of America, Pinyeda says. But if there's a chance to get a job here in Mexico, he's willing to take it. GENARO LOPEZ: There's around 10,000 open jobs available in the maquiladora industry. WELNA: That's Genaro Lopez, the alderman who represents this part of Tijuana. The assembly plants, known as maquiladoras, that surround the city, he says, are hurting for workers - a problem locals blame on low wages. LOPEZ: Those are the factories that work for big names like Sony, Pioneer and stuff like that here in Tijuana - Panasonic, Samsung. WELNA: In a large covered courtyard about a 20-minute walk from the migrant shelter, scores of scruffy looking men and women take numbers and line up for job interviews. This jobs fair was organized by federal and state officials. Nayla Rangel is the fair's coordinator. She says so far more than 2,000 migrants - nearly half the adults in the camp - have signed up for one-year humanitarian work visas. WELNA: "We need human capital," she says. "The companies here keep asking for more workers. And we're short on what we can supply them with. These migrants and that demand," she says, "make a very good match." WELNA: Representing the maquiladora industry at the jobs fair is Esther Leyva Portillo. She says the companies she works with have 15,000 job openings. ESTHER LEYVA PORTILLO: Maybe in the operations area - this is where they are looking more persons, employees. WELNA: And you can't find Mexican workers to do that job? PORTILLO: It's a little hard. It's a little hard. But they are looking all the options. WELNA: On the street outside the jobs fair is a 42-year-old Honduran clutching a sheaf of papers. Rene Castillo is happy. He begins a new job at 7 o'clock the next morning at an assembly plant, where he'll get the equivalent of a 1.88 an hour. WELNA: "Thank God we've been given a chance to work here in Mexico," he says. I ask if he's given up on getting into the U.S.
WELNA: "No way am I giving up," he says. "I'm a positive person, and I'll just have to give it a little more time." Claudia Hernandez, a mother of four with another on the way, is another Honduran who's just landed a job. She says she likes Mexico. WELNA: But the goal is getting to the U.S., she says - adding it's what every Honduran dreams of. This jobs fair makes some here uneasy. Watching this parade of Central American job applicants is a 90-year-old Mexican. Roberto Sandoval thinks Mexico is doing the U.S. a big favor by giving these people jobs. ROBERTO SANDOVAL: Oh, it's not good. Mexico should protect its own people, not these people that come from foreign countries. WELNA: Whom to help - migrants or Mexicans? It's a dilemma the new government taking office here tomorrow will soon be facing. David Welna, NPR News, Tijuana, Mexico. (SOUNDBITE OF BEATS ANTIQUE'S "SILHOUETTE") Transcript provided by NPR, Copyright NPR.